The Complete Guide to Michigan Sand Dunes by Jim DuFresne presents an inclusive description of everything you need to know about one of Michigan's most impressive and fragile physical features. 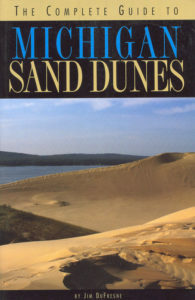 With its comprehensive explanation of dune formation and variety, the 192-page book also includes information on activities at the dunes, including hiking, skiing, picnic and swimming areas, directions and parking, number of campsites, interesting and unique natural features found in and around each dune, and types of dune flora and fauna. Detailed maps provide a ready guide for all outdoor activities. With nearly 50 dune areas, from the remote to the well known, this book will inspire travelers to take a closer look at one of the most awesome natural features found in the state. Even those who think they know the dunes well will find this book an amazing resource for their trips back to a specific dune or their exploration of a new dune. 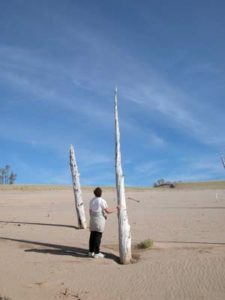 A hiker admires a ghost forest in Sleeping Bear Dunes.